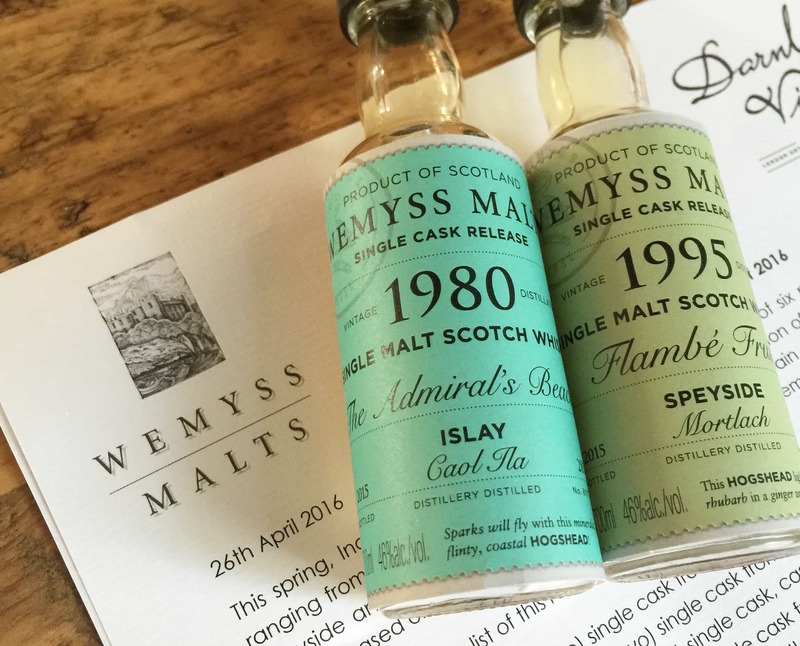 Wemyss have recently won a World Whisky Award for the fabulous blended malt, Velvet Fig. They’re also behind the fascinating and rather attractive Kingsbarns Distillery. So I was rather excited when two samples of their latest batch single cask releases arrived in the post. 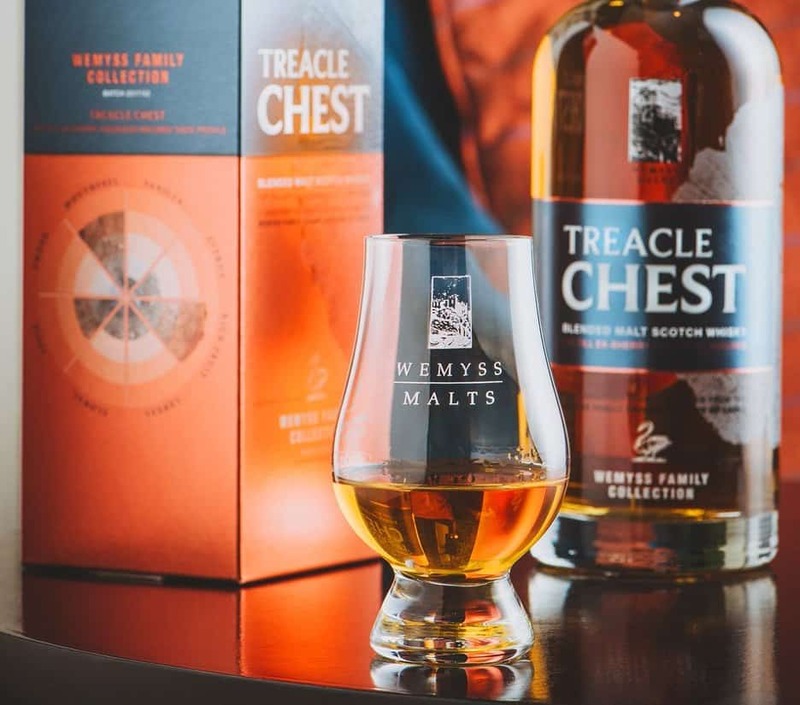 Wemyss’ single casks are chosen by a special Nosing Panel, which is chaired by none other than Charlie Maclean (check out this recent beast of an interview with him). Each one is named after the particular flavours of the whisky, in a slightly more sensible manner than the entertaining nomenclature of the Scotch Malt Whisky Society. I like this. It’s something I genuinely really appreciate, because if you fancy buying a single cask whisky it’s good to get some indication of the contents before you part with your cash. And aside from that, it’s lovely branding. The latest batch of their single casks range has just been released. 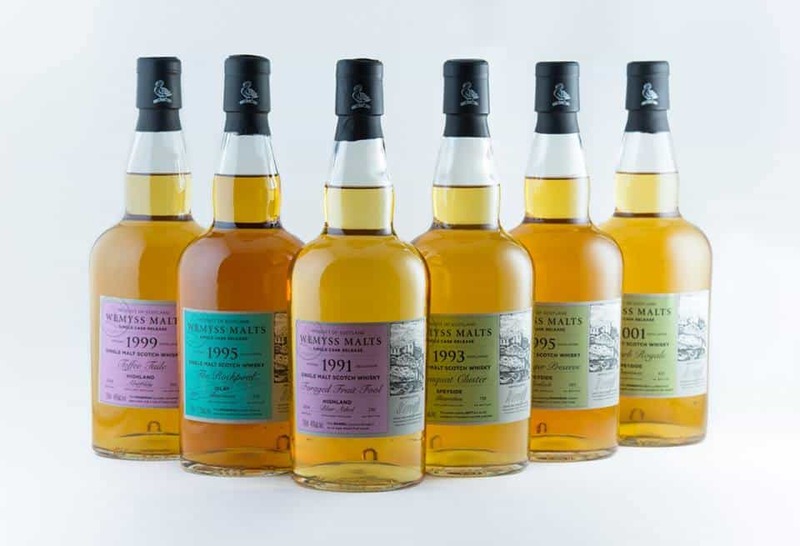 Among them are the “Foraged Fruit Fool”, which is a 1991 single cask from Blair Athol Distillery. There’s the “Toffee Tuile”, a 1999 single cask from Aberfeldy. There’s the “Kumquat Cluster”, which is a 1993 single cask from the Glenrothes Distillery. And “Stem Ginger Preserve”, a 1995 single cask from Mortlach. However, I have two different delights to look at. The whiskies all range between £60 and £120, which strikes me as very sensible given today’s climate. This was distilled in 2001, matured in a hogshead and bottled in 2014 at 46% ABV. Colour: pale gold. On the nose: very attractive mixture of sharp apples and malt-room floor. Grassy and almost like a sharp dry Riesling. Then a lovely vanilla custard note. Pineapple. In the mouth: that’s an excellent texture. Really lovely, velvety mouthfeel. Definitely more delicate flavours: very floral, a touch green-apple-ester-y, but they’re intense versions of those flavours if you see what I mean. Herbal, agricultural almost, yet still a nice layer of summer-pudding sweetness throughout. Honey, touch of mead in the distance. An ever-so-slight touch of brine, which gives an unusual finish. It’s pleasant, a lovely springtime whisky – an apéritif, perhaps, and it feels like a much higher strength whisky than it is. This was distilled in 1995, matured in a hogshead and bottled in 2014 at 57.2% ABV. Colour: deep copper, burnished. On the nose: an exceptionally complex set of flavours here. Maritime, yes – very briny, with pungent seaweed notes. A really earthy sort of peat smoke here, but it’s understated. Very doughy, almost soft cheese notes. Smoked salmon and cream cheese, in fact, spread on a bagel. This really is actually something properly different, genuinely fascinating to nose. In the mouth: mind-boggling. Much of the above, but far more intense. It is a deeply maritime whisky, but with a luscious sweet undertone. The peat is incredibly well-integrated with any woody notes. Smoked haddock. Seaweed. Hedgerow jam, maybe chutney. Pencil boxes. Redcurrants. 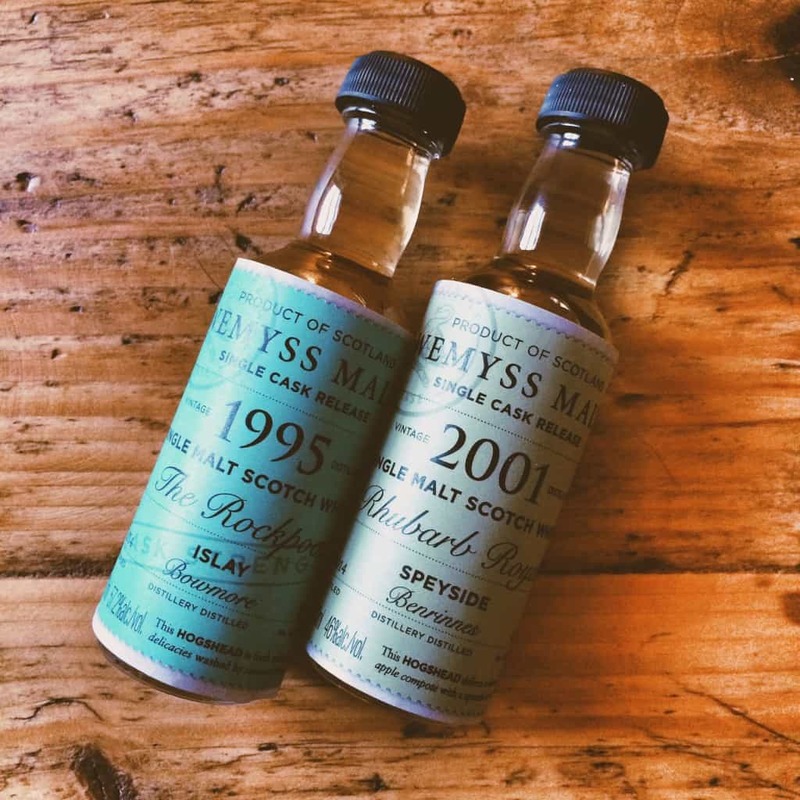 For a single cask, the balance between the flavours is absolutely spot on. Quite a light texture and a sweet, citrus, salt-rubbed finish. I don’t tend to get excited about Bowmore all that much, but this is a rare exception. Mood: this is autumn walks by the coast, then curling up by the fire with a mug of tea and a Victoria sponge. But this one goes beyond mood – this is worth flagging as a whisky of considerable quality. “Rhubarb Royale” was good, though if I was going to part with my cash I’d easily opt for the “The Rockpool”. It casts its flavour net widely, yet it all comes together rather well. 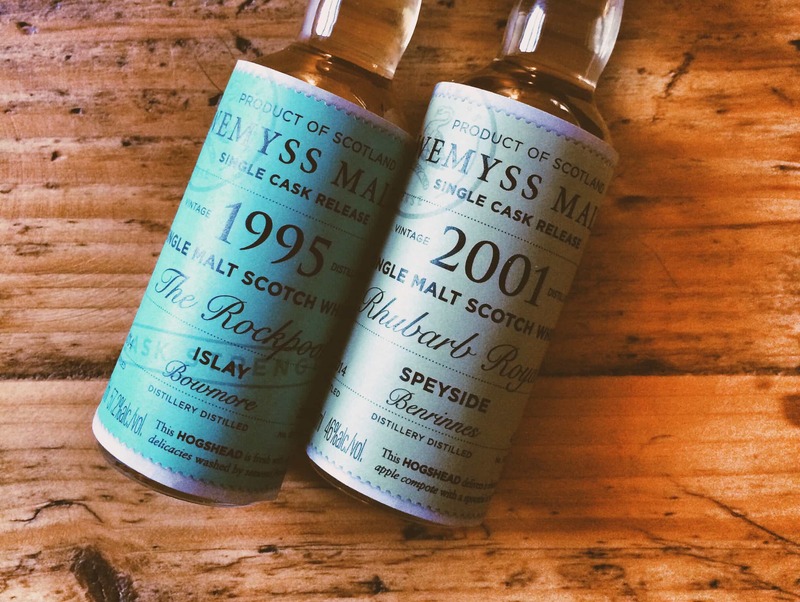 It’s genuinely something different, something to excite even the most jaded whisky palette.